An article in The Irish Independent has raised the issue of grading and classification for Scottish Golf Clubs once again. The issued was raised a couple of years ago in Scotland when VisitScotland distributed a list of criteria fopr golf course grading and classification. At the time the issue appeared to receive short shrift from the golf courses themselves and as far as we are aware was then shelved. The fact that the Irish are apparently going down this route is certainly interesting enough in tiself and they are now seeking someone to look after the job of grading and classification for the golf courses. The problems behind grading and classifying something such as the golf course experience was viewed as being fraught with difficulties and in essence the fact that so little of the overall visitor experience could be measured objectively was seen as the key issue. In defence of the QA department, the draft documentation undoubtedly based on their experience in classifying visitor attractions was comprehensive. The problem in grading and classification however must be the consumer acceptance of the validity of the gradings. Two star clubhouse facilities in a remote west highland course but with 5 star views across the loch; how many points would Brora have for sheep droppings on the fairway for instance! Our thought at the time that the document produced would have had a very positive impact on how golf courses could and should audit their own levels of service but not necessarily translate to relevant information and guidance for the visitor. It's often the case that the hammer of compulsory grading is use to crack the nut of quliaty improvement. Perhaps quality should be encouraged, not forced. It is an argument only. Anyway, Failte Ireland has just launched a search for a "hotel-type" inspection service to rate the country's golf courses and to give those who qualify its seal of approval and under their plan it is expected that more than 200 golf courses will be assessed on things like hospitality and customer service by the end of next year and tenders to carry out the work have just been issued by the tourism authority. They also recently issued a tender document to investigate a "federated tee time search" facility. The assessment service will look at the whole customer experience and what services clubs are providing such as the booking process, club facilities, hospitality and reception and those which meet the standard will become a Failte Ireland-approved course. Strangely similar to the proposals issued by VisitScotland. In response to market research results, a working group developed a set of minimum standards which have just been piloted in 18 golf courses and the plan is now being rolled out across the country and the plan has the backing of the Irish Golf Course Owners Association. "We are just like restaurants and hotels, we provide a service to the people," secretary Bernard Gibbons said. "There are standards that will have to be met and it will make sure people keep to those standards." We shall keep an eye open on how they plan to proceed. Whilst not Scottish by any stretch of the imagination, it was worth highlighting that The Belfry that world famous golf resort in The Midlands has just recently converted its booking engine to use Bookassist. The Scottish office, based in Ayr are delighted at the news and hope that some of the top names in Scottish hospitality will look once again at what the system can offer for the luxury end of the market. Paul Melanophy, Online Manager for Quinn Hotels Group explains, "We have been using Bookassist in our two Irish hotels - the Slieve Russell, Co.Cavan and Buswells, Dublin for over 18 months. During this time there has been a dramatic increase in business through the direct online channel especially since starting the Bookassist Trafficbuilder programme. The relationship with Bookassist has been a very fruitful one and we have now integrated a third property - The Belfry, Birmingham, UK. Bookassist are very reliable and adopt a very "hands on" approach to their service. They provide an excellent product through their booking engine and their online marketing service is second to none. The Bookassist staff are always at the end of the phone and pushing the boundaries to ensure customer satisfaction." James Kennedy from Bookassist in Scotland, "It's fantastic news that the Belfry have converted to Bookassist and they are confident that it will not only increase their conversion rates but give them much greater control of their rates and inventory, add ons and guest functionality than they had with their previous system." From our point of view in Scotland we hope that it will let other similar properties aiming at similar markets that Bookassist is the most cost effective option for increasing their on line sales. Tied in with Channel Management, multiple languages, corporate loyalty and Agent access the system is we believe more highly specified and able to manage the top end hotel than any muber of competitive systems. We hope that the news that The Belfry are now using it may encourage a fresh look at what we can do in Scotland for the five star large room operator." You can find out more about Bookassist on their website or contact James Kennedy directly. Today, the 22nd of October saw yet another report from a national business body suggesting that tourism has had a strong summer and that the industry is set fair. Yesterday we received an open email from a highly respected hotelier suggesting quite the contrary and his comments are certainly not isolated. Anecdotally the position appears to have been good in some places, clearly not so good in others but the idea that it's been a good year for tourism needs further research. This survey is purposely simple and as unobtrusive as possible but has been designed to give a snapshot picture of how businesses have been performing and how they themselves view the future. We do not believe there is enough current information out there and even a snapshot of the picture across sectors and geographical areas can help. This is a completely independent questionnaire put out to a couple of thousand businesses in the tourism industry in Scotland, it may not change thinking or revolutionise the industry but it may help inform. We will publish the results fully next week with analysis and it is therefore a genuine plea for you to take two or three minutes to complete the questionnaire for your business. This survey has been sent by Plan B, who publish the TourismMatters Blog and provide marketing and consultancy services to the tourism industry in Scotland. The responses will remain confidential and will not be used for any other purposes than collating a final report which will be made publicly available. Make Sure More of YOUR Guests Book Direct on YOUR Website. In current times some accommodation providers still wonder why they get so many bookings from third party sites as opposed to their own. As we’ve said before in other areas of online marketing simply put yourself in the place of the online customer and make it as easy as possible for them to find you and book with you. One of the most asked questions we get is why am I getting more bookings from third party sites and not from my own website? There are a number issues around website visibility, Search Engine Optimisation, content, design and others. This briefing simply looks at Guaranteed Best Rate or Best Available Rate. Hotels offering online reservations on their own site have to make strategic decisions about what rate they offer to website visitors. Quite clearly many hotels are found in third party websites or Online Travel Agents (OTS’s) such as, for example, Booking.com, HotelRooms, LateRooms, VisitScotland and Hotels.com. Whilst hotels this year in particular have been glad of the third party marketing undertaken on their behalf the market will continue, as with other travel sectors, to move towards booking direct and a growing shift to actually source the hotel they have found via the third party website. Potential customers however will by nature browse and whether we like it or not this will often involve price comparisons. If they can book your hotel somewhere else cheaper they invariably will. They close down the hotel’s own booking engine and books through the third party site at a higher commission level. Sound familiar? A customer searched for a hotel in your area and finds your property on a Price Comparison site. They like the sound of your property and wish to make a booking. Do they just click Book Now? Actually, no. They will still search out the best price and many will then type in your hotel’s name into their search engine, click through to it and check price and availability DIRECT! If you have Guaranteed Best Rates on your site you will have increased the chance of securing a direct reservation at a higher rate and the knowledge they are your direct customer! So for the independent or smaller hotel that is trying to drive increased traffic through their own website is it essential that they offer a Guaranteed Best Rate assurance through their own website. If some of your marketing contracts insist on you offering them guaranteed best rates then the worst your own website should offer is “rate parity”. It’s simple really, if the booking comes through your website, you retain the customer details and avoid future third party marketing diverting them away from you; you make the direct contact, retain the booking information and the booking is clearly direct with the hotel – something that increasingly the online buyer is considering valuable. The online voting for the Golf Tourism Scotland Gold Awards is now underway ahead of the annual awards dinner to be held this year at Turnberry Resort on the 5th of November. The nominations in all categories are as follows. The nominees for the Golf Tourism Scotland Gold Awards have just been announced ahead of the Annual Awards dinner to be held at Turnberry on the 5th of November. We're delighted that five of our online clients have been nominated for an award including Gailes Hotel and The Inn at Lathones in the Large Hotel Category, The Old Loans Inn in Small Hotel category and McLaren Travel in the Transport Operator of the Year Category. In addition we are delighted to also provide Ogstons on North Street in St Andrews with the Bookassist online reservations engine for their website - Ogstons have been nominated in the small hotel category as well. We wish them all the very best of luck in their respective categories. The 5th of November is also the target date for The Edge in realtion to ensuring that the new Golf Tourism Scotland website explodes with proverbial fireworks onto the internet with the planned unveiling of the new design and content at the AGM before the dinner. 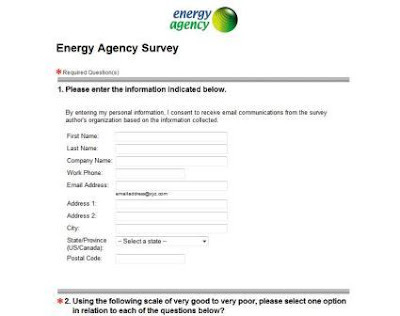 One of our clients, the Energy Agency, has recently signed up to use ConstantContact to drive their online newsletters. The Edge have provided the training and support in getting the system up and running but also introduced the Ayrshire based team to the joys of online surveys and questionnaires. As a direct result the Energy Agency are using the survey tool within Constant Contact to monitor the effectiveness of their recent Sustainability Fair. They have created the questionnaire which will be linked to in an email sent to all attendees of the fair asking for their opinions on a variety of issues relating to the show. The questionnaire was easy to set up mixing open and closed, subjective and objective, ranking and multiple choice questions and will give the EnergyAgency live results as the responses are made online. The results can then be downloaded in both spreadsheet and graph format for the client to present and further analyse. Not sure where the PR advice is coming from now but maybe George Sorial, Donald Trump's ambassador to Scotland, may find a thesaurus useful before making his statements. The most recent is accusing Oscar-winning actress Tilda Swinton was of siding with "extremists" after opposing Donald Trump's plans for a multi-million pound golf resort in Scotland. The film star has apparently added her name to a 15,000-strong petition backing four residents at the Menie estate, near Aberdeen, who face possible eviction to make way for the US property tycoon's planned luxury hotel, housing and golf complex and accused the Trump Organisation yesterday of bullying. You can't help but notice the way blogs go and while they aren't necessarily the most representative of media they do often capture opinion effectively. The irony of this cannot be lost on the political chatterers is that the possible compulsory removal of landowners (undoubtedly they would become known as The Trump Clearances!) from their land appears to be supported by an SNP government who I understand have not done a volte face on the Highland Clearances when tenants were, eh, yes forcebly evicted from their premises to make way for amore profitable land use. It's just not going to help labelling those who protest at compulsory purchase orders as extremists. Scottish hotels are about to benefit from the latest language upgrade for their Bookassist booking engine and will now be able to offer a Russian Languaqge option from their own website. Bookassist's Central Europe market has a growing business from Russia and hotel clients of the Bookassist offices in the Czech Republic, Austria and Poland are seeing an increasing demand for online services from Russian visitors. As a result, Bookassist has announced the Russian language and Russian Ruble version of its leading Booking Engine software. How time flies, eh? It's now been two years this weekend since The Edge hit front page headlines in the newspapers with our Loch Lomond Children in Need Campaign and we thought it was as good time a time as any to reflect on the experience. Sometimes it's difficult to define your business. Design, marketing, web development, e-commerce, promotions, PR, product development? They all have a place but sometimes it's projects and clients that explain things better than we ever can. And to some extent that's just what our "Sing Loch Lomond for Children in Need" campaign did a couple of years back. The project, even for us, was a big bit of out of the box creative thinking, lots of project management, developing strong and mutually beneficial partnerships, having focussed objectives and targets, strong design, effective web presence, positive e-marketing, good strong copy writing. When they all come together - and they can come together - it describes our business and our thinking and ethos better than any number of words could. So when you secure front page Daily Record, double page spread and editorial, BBC Scotland coverage, live broadcast from a Scotland international, 500% increase in web traffic, enquiries for website advertising opportunities and a major jump in e-commerce sales through the website and a UK Top Ten record for Runrig and The Tartan Army then perhaps we should be reminding our clients that this is indeed what we can do! The project from start to finish was great to be involved with. 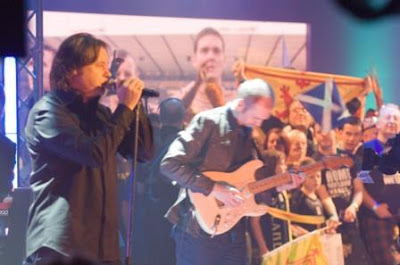 Simply pitching the idea to Runrig of recording a new version of Loch Lomond was the first hurdle and it was with some considerable fortune that Steve Cullen, Runrig's manager saw the potential just as much as we did. BBC Scotland were next and likewise the opportunities of a fantastic campaign tied in with the Tartan Army's final match against Italy hit the net in style! So we now had the lead artists, the full support of BBC Scotland. All we needed to do was convince the SFA that we could mic up Hampden and record 52,000 Scottish football fans at half time! Easy? Well actually it was and Colin Banks pulled out all the stops to make that part no problem either. He even allowed us to record the squad singing the track at Cameron House on Loch Lomond. The Edge even produced a karaoke version of the track for the big screens at Hampden to ensure the crowd sang in time! After that it was a rush job to get the single remixed which Runrig looked after at their Danish studios while we designed the CD and promotioanal artwork for the campaign including a Loch Lomond downloads page. The Daily Record loved the concept and for the whole period of the campaign supported the whole thing from start to finish. Front page features were followed by double page spreads and artist interviews and readers competitions making sure the entire nation knew what was going on. The highlight for all involved however was an unforgettable Children in Need night at the BBC Studios in Glasgow. The Edge had been asked to get three hundred Tartan Army to the studios on the night for a live rendition with Runrig; not a problem given that it was the evening before Scotland's biggest Hampden occasion in years and if you were one of that group it will live long in the memory from the march along the Clyde from the Renfrew Ferry into the studios and the most amazing piece of live television which even now raises hairs on the back of the neck watching it. The ending however was as usual the same. Scotland failed to qualify against Italy and the Euro Dream was over; even an early morning phone call from the record company on the Sunday morning with the amazing news that the song had charted at number nine in the UK charts couldn't lift that cloud! It must be said however that listening to Fearne and Reggie introduce Runrig and The Tartan Army was pretty cool! Anyway, it's always worth having a look at that video all over again - it's had more than half a million views on YouTube - and if you wish buy the track on iTunes! It was an achievement and a half and showed what collaboration can achieve. Thanks for the memories again to Steve and Runrig, Colin and the SFA, Donald and Grigor at BBC Scotland, Alex McLeish and the Scotland Squad, The Daily Record, Nigel at Active Media and of course the wonderful Tartan Army! Kilmarnock (Barassie) Golf Club are now owners of a shiny new website designed by The Edge in Ayrshire. who have been looking after Barassie's online presence for a number of years and the new design and structure simply builds on the progress made over the years. The site is powered by The Edge's own tourism content management system, The Claymore Project, and allows club secretary/manager Donald Wilson to update everything and anything he wishes to. He can upload minutes and files into the secure members' Section or publish visitor information and updates, change images in his gallery or even publish YouTube footage directly to the site. New content includes a History and Heritage section which over the coming months will increasingly feature archive materials from the golf club's history - the first phase includes a PDF version of the 1937 Jubilee Book celebrating the golf club's first fifty years. New image galleries, pro shop pages and a Short Breaks section are all aimed at increasing the visibility of the golf club to visitors as well as keeping members' informed. The club has even taken a grip on the Social media media bandwagon and now has its own Facebook page where visitors can be come Fans of Barassie! 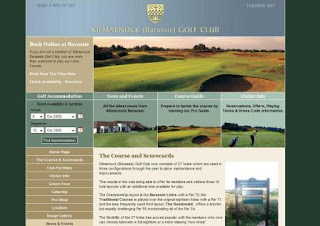 Kilmarnock (Barassie) Golf Club are now owners of a shiny new website designed by The Edge. We've been looking after Barassie's online presence for a number of years and the new design and structure simply builds on the progress made over the years. The site is powered by our tourism content management system, The Claymore Project, and allows club secretary/manager Donald Wilson to update everything and anything he wishes to. He can upload minutes and files into the secure members' Section or publish visitor information and updates, change images in his gallery or even publish YouTube footage directly to the site. A £1.2 million funding package has been given the green light by Scottish Enterprise to deliver key tourism improvements across the Royal Deeside and Cairngorms. The funds will help position the area as a world class destination that competes with high quality mountain valley locations around the world. Tourism development in the area is one of the key priorities for public/private partnership Aberdeen City and Shire Economic Future and SE's investment is part of a wider £5.8m programme that includes funding from Aberdeenshire Council, Cairngorms National Park Authority, Scottish Natural Heritage and VisitScotland. Scottish Enterprise also estimates an additional £14m in private sector investment will be generated through accommodation and resort development as a result of public sector support. The main objectives of this latest investment programme include: Support for the Destination Management Organisation (DMO), Royal Deeside and the Cairngorms Ltd, to build robust industry leadership and deliver workforce development, a strong brand, marketing plan and programme of events. Completion of connecting path networks and signage along the long-distance Deeside Way, to position the destination as a leading area for walking and cycling. Working with investors and developers to appraise new and existing resort and accommodation opportunities which are vital to the transformation of Royal Deeside and the Cairngorms. Work to further develop and enhance the Deeside and Cairngorms as a key tourism destination began in 2006 with the creation of the private sector led Royal Deeside and Cairngorms DMO which brought together industry leaders and business groups in Deeside under a shared vision to improve the product quality and visitor experience. Since then membership of the DMO has grown and it has been involved in the development of a new winter festival of events including the Enchanted Glen event, held in December 2008 at Glen Tanar, attracting over 4000 visitors. David Littlejohn, director of industries and infrastructure at Scottish Enterprise, said: "Over the past two years the foundation has been laid to develop Royal Deeside and the Cairngorms as a world class sustainable tourism destination. This targeted investment will now allow our strong private and public sector partnership to build on that foundation and put in place the infrastructure, product innovation and business development required to take the visitor experience to the next level, which in turn will grow tourism revenue and contribute to the Scottish Government's Tourism Framework for Change." Claire Bruce, chair of Royal Deeside and the Cairngorms DMO, said: "This is a very welcome boost to the further development of Royal Deeside and the Cairngorms area. The business community across the region welcome the continued support in business develop and product innovation and we are confident that this funding will contribute significantly to the long term sustainability of the area as one of Scotland's best tourism destinations." Cllr Peter Argyle, a Deeside Councillor and chair of the Council's Infrastructure Services Committee, also welcomed the new investment : "The businesses in the area have invested time and effort into this new Destination Management Organisation and the continued support from Scottish Enterprise can be seen as a reward for their commitment. The Council will continue to work with the enterprise agency and the Deeside communities on the programme of investments." It is expected that this latest programme of improvements will increase annual visitor spending in the area by 58% to £80.4m and will support an additional 671 direct jobs in the sector by 2015. Proposals supported by the tourism industry in Shetlands to reduce the number of winter ferry trips between Lerwick and Aberdeen have been sunk. Ferry operator NorthLink confirmed earlier this week that none of their proposed changes, which would have allowed extra summer sailings between Orkney and Shetland, will now be implemented. Earlier this year NorthLink had floated the idea of daytime sailings between Lerwick and Kirkwall to ease pressure on cabin spaces during the busy summer tourist season but since no extra money from the Scottish government would have been available for such a move, the company proposed cutting the frequency of winter sailings to cover the cost. Shetland transport partnership ZetTrans rejected the idea after consulting the local fishing and fish farming industry, who said they needed the daily overnight service to Aberdeen to get their produce to the market during the winter months. Shetland's tourism industry, however, was very much in favour of the proposal as it would have increased passenger capacity and encouraged people to invest in visitor facilities. At present, the limited number of cabins on board the two ferries Hjaltland and Hrossey is seen as a major obstacle in attempts to attract more holidaymakers to the isles. Shetland Tourism Association chairman Steven Henry said yesterday that this, combined with an influx of construction workers to help build new schools and ferry terminals, would strangle the tourism industry. "It will be a complete nightmare for the next few years," Mr Henry said. He added that it was crucial that the tourism industry was listened to in the run up to the re-tendering of the NorthLink contract in 2012. "If we could get ferry times for the new contract sorted out, that would work a lot better. A lot of people have been put off from coming to Shetland. If you can't get here, then you will forget about Shetland," he said. A NorthLink spokesman said: "The possibility of carrying out return daytime sailings between Lerwick and Kirkwall during the time when the vessel is normally berthed in Lerwick, and thus providing additional capacity in the summer, was floated as a discussion point. Soundings were taken from a number of quarters and the issue went out to consultation. The concept didn't find favour with ZetTrans and, accordingly, was taken no further." The tourism industry in the Highlands received a boost last night after an airline announced its summer trial of flights between Düsseldorf and Inverness will be extended into 2010. The weekly service operated by Lufthansa’s ended in September but had been recognised as having increased the number of German visitors to the north of Scotland this year. It is believed flights will run over a four-month period next year, a month longer than this summer, but the spokeswoman said no decision had been taken on timetables. Germany has become Scotland's largest European market with around 300,000 Germans coming to Scotland in 2008 spending an estiamted £187million. East Kilbride based Olympia Skating Club are this week celebrating the launch of a brand new website. The club approached The Edge in September with a view to giving the club an on-line profile and as part of our ongoing support for youth sport and development we were delighted to help with a discounted proposal for the club's committee. The result appears to be a positive outcome for the club who were delighted with their new on-line presence. The site is powered by The Edge's content management system The Claymore Project and allows the club's organisers the ability to update their own news, events, images and even picture galleries. They can also embed YouTube video footage as well. The site completes a trilogy of sites The Edge have done in the past month for youth sports clubs in Scotland having redesigned the website for Young Killie and a new site for Kilmaurs Thistle youth football club. We got an excellent feature through yesterday from a blog we subscribe to in The States about ten things to do with your landing page. As usual however (as we do with almost everything) we cut it back to three things to do. Three things always seem to be manageable for most businesses even the busiest! How often have you heard that your homepage needs the WOW factor? Well first of all that’s pretty subjective and in all honesty the WOW factor that can be most felt with websites is “Wow that’s bad!”. In the past it used to be about web developers selling their design first; flash images, creating a Wow Factor. We think that’s changed. On the basis that you only have a few seconds to keep the attention of the visitor there has to be an immediate comfort zone which the site visitor feels immediately; that doesn’t not need to be based on moving images or weird and wonderful navigation. Content precedes design. Every time. Brilliant design and Brilliant content will achieve this but so on most occasions will Good Design and Brilliant content. What’s the difference? Well normally several thousand pounds for no major increase in conversion rates. The analogy is the same for websites. You can’t secure the sale in the first five seconds but you can sure as hell lose it. Bad design and bad content will do that every time. So look at your landing page and don’t think what can I do to keep these people but more along the lines of what can I do to ensure they won’t switch me off? Resolve the issue of immediate losses from your site and you’ll then be able to take the nest step and fulfilling their search needs. Is it in response to an advert, an email promotion, Pay per Click campaign, generic search? Whatever the reason for their visit you need to ensure that the reason can be taken to the next level quickly and easily. If it’s in response to a sales promotion ensure your retail offering or availability checker for accommodation providers is prominent – converting to sales is the bottom line after all. Ensure it’s as easy to do as possible from your landing page. Your sale is dependent on the content you have pushing that sale; equally your availability checker should ensure easy checking from the landing page. Don’t just say click here to book; an availability calendar will always gain more clicks. Web 2.0 tools and social media are great but only if they are driving sales. They should also be used wherever possible to drive traffic TO your landing page not away from it. Unless you have a very good reason for driving potential sales towards your social media sites DON’T! Remember it has to be Social Media with Purpose. Your sales tools must be on view on the screen or above the fold as it is known. The top left corner is the most viewed and receptive area on any webpage and your key sales tools should be positioned here including where possible your availability checker. Top right also ranks highly. All your key messages however should be on the screen and not require scrolling. Non sales messages, no matter how cute should not be given the same level of prominence. Special features and promotions should be well navigated. The use of a three column layout has helped many of our clients in the past with graphical calls to action for weddings or festive information sitting below the availability checker. The call to click on them being very clear. 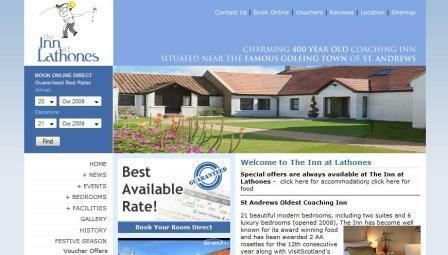 A good example of clear navigation is in the recently redesigned website for Gailes Hotel in Ayrshire. Similar use of bold banners pronouncing Best Available Rate or Sign up for E-News, Facebook or Twitter can all generate action.